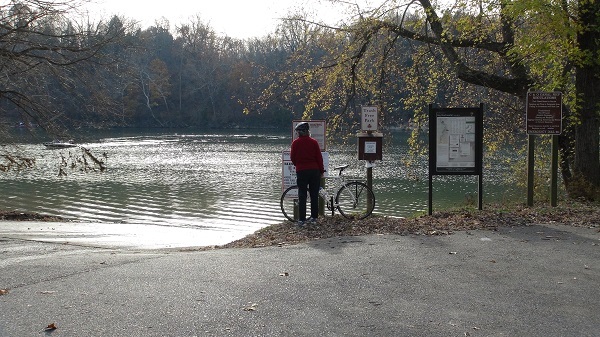 Big Slackwater boat ramp has access to the Potomac River and is located off Dam 4 Road. There are 55 parking spaces, including parking for trailers. The boat ramp and parking area are adjacent to a major reconstruction effort by the National Park Service that began in August 2010. In October 2012, the Park Service celebrated the completion of the project, which restored approximately 2.7 miles of the canal topath that were closed after the Potomac flood of 1996, with a circuitous 5-mile detour on narrow public roads. The $17.4-million project involved reconstruction of the towpath and a 4,000-foot wall on a rock ledge over the Potomac. According to the National Park Service, this part of the towpath has been repeatedly damaged since the canal ceased operations in 1924. With the project complete, the canal is now uninterrupted for its entire 184.5-mile length.